Northwest baskets come from several different coastal tribes along the northwest Pacific coast, spanning from southeast Alaska to southern Oregon. Baskets from this region traditionally were for gathering, cooking, storing food and also for ceremonies. The structure of the basket reflects its purpose. Cooking baskets, before the use of pots, were woven water-tight. These baskets could hold liquid and cook food when red hot rocks from the fire were put in. Baskets used to collect from along the coast were sometimes woven so that water could drain and the food could be rinsed. Common materials used are beargrass, cedar bark and root, spruce root, cattail, horsetail root, Oregon grape root, and various grasses and reeds. 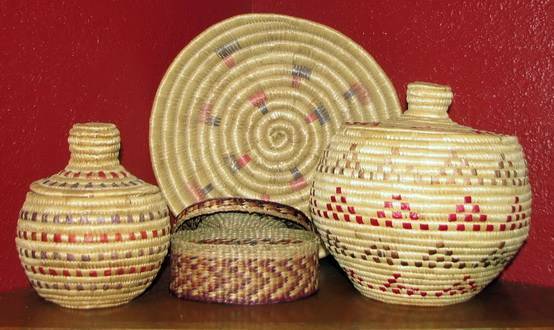 After the late 1800s, more baskets were woven to sell. The weaver often times focused more on aesthetic than function and many different designs were created during this time as a result.